Texas' culinary reputation may be based on chili, barbecue and chicken fried steak, but the state was raised on beans. Pinto beans, butter beans and black eyed peas. There is some debate as to whether black-eyed peas are peas or beans. For this writer, they are close enough to being beans to suit me. Pinto beans kept the wolf away from a lot of Texas doors. They have always been inexpensive and nourishing. Combined with corn they form a protein that will sustain life. There is hardly any way you can cook them that they don't taste real good. My mama's pinto pot contained the beans, a little bacon or bacon grease, salt and pepper. That was it for the seasonings. Years ago, your pinto beans usually had a few rocks, stems and assorted things that you didn't want to cook mixed in with them. The way you cleaned the beans was to pour them out on the table and rake a few at a time off into the pot in your lap while discarding the rocks and other debris. One day my mama was "sorting" the beans with one of the cousins watching. The tike asked, "Aunt Daly, why are you counting the beans"? After the beans were sorted, they went into the pot to be covered with water and allowed to soak overnight. Pinto beans require several hours of cooking time. Best results come from cooking them at just over a simmer. Three or four hours will usually do it. If you need to add some water during the cooking, always try to add boiling water so the cooking process won't be interrupted. You will want to stir the beans a couple of times during cooking. When the beans begin to get soft, mash a few against the side of the pot with the bottom of your spoon. This thickens the juice so it will cling better to your cornbread. My aunt Elizabeth Meyer made a really good pot of pintos. She used a little garlic and a touch of chili powder in her beans. 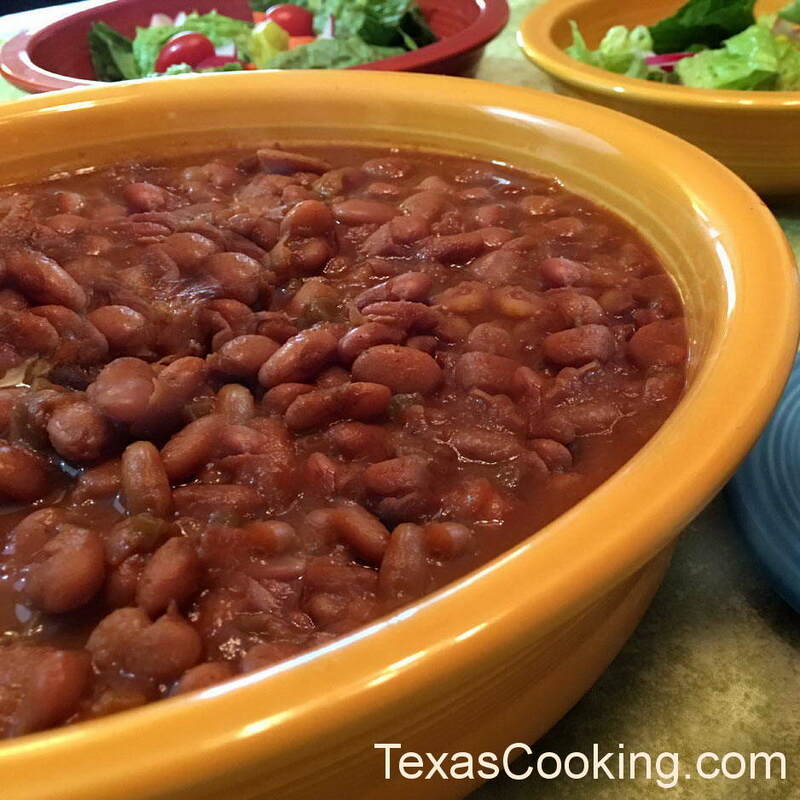 The basic pot of pinto beans requires only a little bacon or bacon grease and salt and pepper .If you are of a mind to, you can use salt pork, ham, or sausage in your beans. You don't have to stop there. Green chilies, red chilies and tomatoes all go well in the bean pot. If you keep your juice a little on the thin side, you can cook dumplings in your beans. If you cook just the basic pinto recipe, leftovers can be easily converted into refried beans for your Tex-Mex recipes. All you have to do is put a couple of teaspoons of shortening in your best cast-iron frying pan and, when the shortening is good and hot, add the leftover beans. Mash the heck out of the beans and constantly turn them until they are nearly dry. What could be easier? I once won a bean cooking competition with my butter beans. Not a very elaborate recipe. I soaked the beans overnight as usual, and then cooked them in homemade chicken stock. When they were done, I added a generous portion of real butter, and I had a winner. Butter beans cook faster than do pintos. After the overnight soaking, they should be done in less than two hours. Again, you don't want to boil them to death, just above a slow simmer will do. Butter beans get along well with bacon or ham seasoning. Doesn't take a whole lot. To me, butter beans need a little more black pepper than do pintos. Don't forget to put a dab of butter, real butter, not that greasy kid stuff, into your butter beans before serving. There's a large group of Texans who say that black-eyed peas just can't be beat. I like to cook some red potatoes that have been peeled and cubed in my butter beans. I call it my "bean soup". Really good on a cold winter day. There's a large group of Texans who say that black-eyed peas just can't be beat. Their slogan is "They're not just for New Years anymore". It is traditional in Texas to have a serving of black-eyed peas on New Year's Day to bring you good luck. I can't vouch for that but it sure can't hurt. Dried black-eyed peas are prepared as any bean. Soak overnight, season with bacon or ham and simmer until done. A lot of fresh black-eyes are eaten in the "snap" stage. That is, some of the peas are ripe in the pods while some are green. The green pods are "snapped" into manageable size and cooked along with the mature peas. Season with ham hock. The best recipe I've found for black-eyed peas is more of a salad than anything. It's called "Cowboy Caviar" or "Texas Caviar" depending on where you get the recipe. Combine the above and store, covered, in refrigerator overnight. Keeps well. For those of you who don't like sticky, sweet desserts, here is a recipe that will get everyone's attention. Mix all the ingredients well. Place in an unbaked pie shell, top with pecan halves, and bake in a moderate oven (350°F) until done. This is a dessert that is more than likely good for you. Any way you prepare your beans, except for the pie, always have some fresh cornbread or corn muffins at hand. Don't ever serve any of that gooey store-bought white bread with your good beans. Beans are always complimented by having fresh tomatoes and onion nearby. Maybe a dill pickle too.